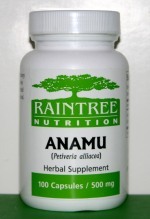 Anamu is traditionally used for colds, flu and viruses. Also for candidiasis and other yeast infections. In addition it is also purported to be good for urinary tract infections. Many biologically active compounds have been discovered in anamu, including flavonoids, triterpenes, steroids and sulfur compounds. Raintree’s anamu has been sustainably wild-harvested in the Brazilian Amazon. to learn more about our rainforest ingredients and wild harvesting methods. This product contains no binders, fillers, or exipients and is 100% finely milled natural anamu. Ingredients: 100% pure anamu whole herb (Petiveria alliacea). It is a wild harvested product—grown naturally in the Brazilian Amazon without any pesticides or fertilizers. Suggested Use: Take 2-3 capsules twice daily or as directed by a health care professional. Drug Interactions: None published. Due to anamu’s natural coumarin content, however, it is conceivable that it might potentiate the effects of coumadin (Warfarin®). Anamu contains a low concentration of coumarin, which has a blood thinning effect. People with blood disorders, such as hemophilia, should be monitored closely for this possible effect. This plant has been shown to have hypoglycemic effects in mice. People with hypoglycemia should be monitored more closely for this possible effect.